Sport is an intregal part of life at Moor Park, and while we believe it is important to play to win, we also regard the taking part – the teamwork, learning to win and lose, the development of self-esteem and social skills, the healthy exercise, as well as the fun – as equally valuable. We want each child to leave Moor Park having enjoyed playing and with experience of many different games, while developing the sporting skills necessary to appreciate the value of ‘sport for life’. We believe that attitude towards sport is as important as the ability within sport. We aim to coach all the children from a grass roots level, ensuring that they receive quality coaching right from the early stages in Year One and Two. By the time they reach Year Three all children will have opportunity to be involved in a team according to their ability level. As part of the curriculum, children at Moor Park participate in four games sessions each week, including match days, which concentrates on a major sport each term. Matches are exciting and competitive events and take place on Tuesday, Wednesday and Saturday afternoons and parental support is always welcomed. Those children not involved continue with further training or an alternative sporting activity. In addition to our games timetable, PE is taught to all, following the National Curriculum, incorporating swimming, gymnastics and dance. 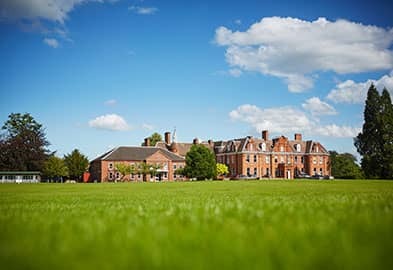 With acres of sports fields, a floodlit astroturf, Sports Hall, the Henderson Hall, a swimming pool, all-weather cricket, tennis and netball facilities together with a squash court, our children enjoy the finest of facilities.